Due to logistical challenges, this meeting scheduled for Nov. 7th is cancelled. We are looking to confirm another date, and will update everyone with the new date & time shortly. Hello from the new HOA board of Summit Chase Cluster Board (aka Autumn Ridge Cir Cluster ) ! Thank you all for patience. We have been collecting emails and phone numbers for our email distribution list (DL). Thank you to everyone who has shared their contact and all who helped. If you didn’t get the email, please reach to Ram (rks.1491.arc@gmail.com) with your email address. Please mark your calendars for Tuesday November 7th at 7 pm. This is the first board meeting of this fiscal year. The meeting is at the Neil Armstrong Elementary school either in the Library or the Cafeteria. Ratify the budget-we will be discussing the quarterly assessment. Discuss the plans for community improvement through the proposals outlined in the Engineering and Arbor Study. Please review these on the Summit Chase website; summitchasecluster.org Please email all questions about this plan to: info@twcmanagement.com in advance of the meeting. 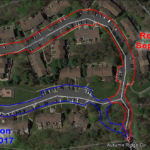 Anyone interested in Fairfax County’s interest in radically increasing the density of Reston in the near future; please plan to attend a meeting at South Lakes High School October 23, 2017 in the Cafeteria. Please speak to your neighbor John Nusbaum @ 1579 (johnmaria83@verizon.net) for details about this issue. Happy Halloween & see you around in the neighborhood! Due to the rain today, the patching and paving work has been postponed until tomorrow, Thursday September 7th. The Summit Chase Cluster Association Board of Directors commissioned an engineering and arbor study of the common areas due to concerns about excessive erosion and run off storm water effecting common property and individual homeowners. The study is available below for you to review how it will effect your property and the common areas. Please review and forward any questions to TWC Management. The board will address these questions at the annual meeting September 13, 2017. Please plan to attend the annual meeting for this discussion as well as the election of officers and discussion of the budget. The Board of Directors invites all members to the Annual Meeting of the Summitt Chase Cluster Association for 5:30 pm Wednesday September 13, 2017. The meeting is held at the tot lot. This is an opportunity for members to review the financial health of the association, find out what the board accomplished and is planning for the next year. The Board of Directors is happy to announce the completion of the updates to our Bylaws, Regulations, and Handbook. The board worked closely with the association’s attorney for several years to bring our documentation into compliance with current laws. NOTE: Please discard any past copies of the Bylaws, Parking Regulations, and Trash Regulations. The changes in the handbook supersede all other documentation.